While we all know that camping is fun, great and so on, we also know that it entails careful planning to make it a memorable and fun experience. But the thing is, you don’t need to be a seasoned camper to enjoy camping. You don’t have to be a camper for 10 years or more to experience what an amazing camping trip is. With these useful tips, you will know the secrets to having a wonderful camping trip. Create a checklist and bring only the real essential things. Bringing a dozen suitcases filled with what you think are important will not only slow you down but might ruin your camping trip. Ration out supplies like medication, fuel, lotion, shampoo and the like in smaller containers filled with the amount that you’ll need for the duration of the camping. Add only a little extra for emergency. Pick a spot with a clean and safe water source. Bringing too many bottles of water will slow you down and not having enough to drink will dehydrate you. Choose a shady spot. But don’t pitch your tent directly under the trees because it is dangerous in case of sudden thunderstorms. Spray ammonia on garbage to remove the smell of leftover food and to keep animals away. After washing, use baking soda on your hands and clothes to remove the smell of food so bears and other wild creature will not go near you. Draw lines around your tent floor with chalk. This will keep ants and cockroaches away. To protect yourself from mosquitoes and ticks, wear insect repellent lotion and tuck in your clothing like your shirt into your pants, pants into socks and so on. Prepare and measure ingredients at home before you leave for the camping trip so that you need not bring your measuring spoons and cups. Place the pre-measured ingredient in small containers and be sure to label them so you don’t mistakenly put salt in your coffee. Half-cook food at home to save cooking time and fuel at the campsite. Always cover pots and pans while cooking so that food are cooked at a much faster time. Make your matches waterproof by dipping them in nail polish or melted paraffin. Try being naked when you sleep in your sleeping bag. The heat of your body will be reflected back to you. Don’t forget to bring a catalytic heater like the Coleman BlackCat™ Perfectemp™ Catalytic Heater that will provide you with safe and flameless warmth for a comfortable sleep. Don’t forget to bring the hiking essentials: snacks, water, watch, whistle, cell phone, compass, flashlight and knife in case of emergency. Opt for light running shoes and nylon socks if hiking boots cause blisters on your feet. Put a wet towel on top of your head if it’s hot. This will help keep you cool despite the scorching heat of the sun. These tips will prepare you for your camping trip. 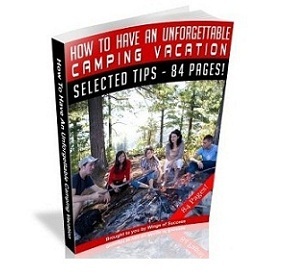 And your camping trip will surely teach you more tips that you can add to these ones.